What types of chain are there? How is each type (shape) used? What application (material) should I select? What is the difference between stainless steel pins and plastic pins? How do I select rail material? How do I install straight rails? What are some conveyor designs for top chain and plastic block chain? What are some conveyor designs for plastic crescent chain? How do I disconnect and assemble plastic top chain and plastic block chain? What should I be careful of when using plastic top chain, plastic block chain, and plastic pins? Is forward-reverse operation possible with plastic top chain and plastic block chain? How do I know when to use plastic modular chain? How do I disconnect and assemble plastic modular chain? 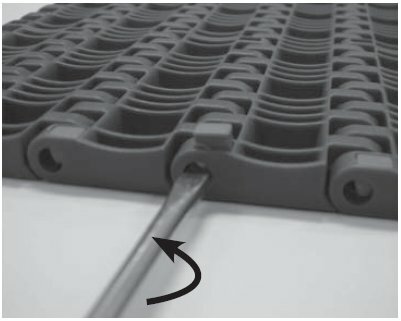 How about conveyor designs of plastic modular chain? Is forward-reverse operation possible with plastic modular chain? I need to make a conveyor with a compact transfer area. I need to eliminate items remaining when using right-angle conveyors. The most commonly used series is the Standard Series. LF Series, which features low friction and wear resistance, is often used to convey beverage containers. In addition, we recommend our ultra-low friction and wear resistant ALF Series if you need smooth sliding to minimize catching of conveyed items. These three series are standard chains. For other non-standard series, you will need to select from our high function series according to the application and purpose. Chemical Resistant series (Y, SY), High Temperature series (HTW), Heat Resistant/High Speed series (KV180/250), etc. *See the selection page in the Tsubaki catalog for chemical resistance. Heat Resistant/High Speed series (KV150/180/250), High Temperature series (HTW), etc. Electroconductive series (E), Heat Resistant/High Speed series (KV150, 180, 250) *Needs to be grounded. Medium Friction (MF) series, Impact Resistant (DIA) series, etc. Impact resistant (DIA, DIY) series, Metal Detectable series, etc. Stainless steel pins are becoming predominant for plastic block chain. Depending on the product, the allowable load is greater than with plastic pins. Stainless steel pins are recommended when there are impacts on the chain. 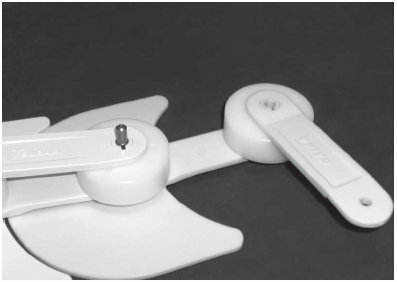 Improvements have been made to the structure of the thick plastic pins and hinges. Long life: A combination of proprietary Tsubaki materials allows the chain to exhibit outstanding wear resistance between the pin and bushes under dry, soapy water, or wet conditions. The chain works particularly well when using water as the lubricant. Lightweight: 15% to 25% lighter than stainless steel pin top chains. Easy to handle and effective in reducing noise and required power. Easy disposal: As the entire chain is made of plastic, it can be disposed of as is. Conforms to food sanitation regulations: The links and pins are manufactured from materials that are in accordance with Japan's Food Sanitation Act. When installing plastic chains, rails are generally installed as well to guide the chain. Select the material for your rail based on your application and purpose. Rails made of ultra-high molecular weight polyethylene (Solidur and plastic rails) are often used. Recommended for use in lubricated conditions. *Be aware that more wear debris will be generated when used in unlubricated conditions. Conventionally used for general-purpose applications; manufactured from UHMW-PE (ultra-high molecular weight polyethylene). Recommended for use with stainless steel chains. Do not use in environments where rail components will be exposed to steam. Superior wear resistance and low friction (compared to P Plastic Rails). Compared to P Plastic Rails, can reduce amount of wear dust generated to the level of M Plastic Rails. 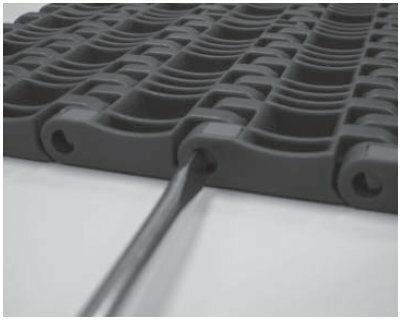 Can reduce coefficient of friction of chain to approximately 20% of P Plastic Rail levels. Plastic rail designed specifically for dry conditions (do not use under wet conditions). Especially recommended when generation of wear dust may be a source of problems. Metallic rails are recommended. Use smoothly polished or hard chromium finished + buffed top finished rails. 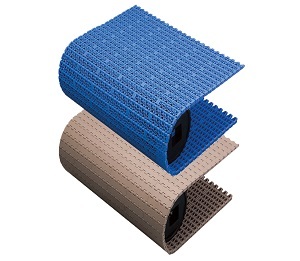 Recommended wearstrip material is cold-rolled stainless steel. Secure only one end of wearstrips to allow for thermal expansion. Also, remember to leave a gap between wearstrips to allow for thermal expansion. 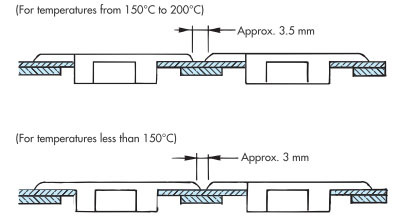 Standard steel sprockets can be used for ambient temperatures below 150°C. 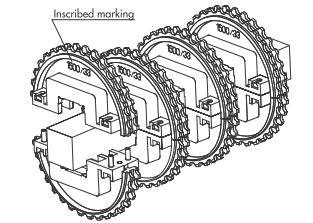 Special sprockets must be used at temperatures higher than 150°C. Contact a Tsubaki representative for details. 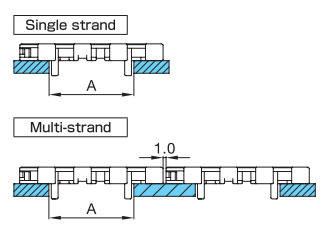 Spacing between chains when multiple strands are used is shown below. 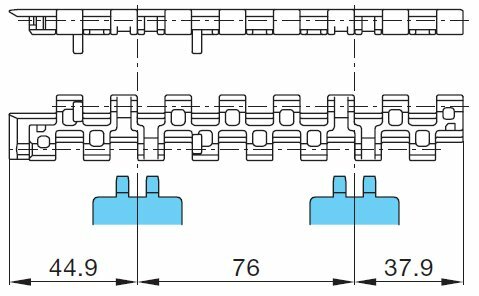 Take-up must be done to compensate for slack in the chain caused by thermal expansion. Take-up adjustments should be performed after reaching operating temperature. Lower temperatures only after loosening take-up. Black wear dust will be generated. Be sure to clean on a regular basis. Start up slowly (using inverter control) and stop slowly. 1.Refer to “No lube” for Lambda chains. 2.Select stainless steel or steel wearstrips for KV series chains (heat resistant, high speed) for normal temperatures, and a stainless steel wearstrip for high-temperature applications. 3.Recommended metallic wearstrip is cold-rolled steel. 4.The recommended lubricant for steel rails is oil. 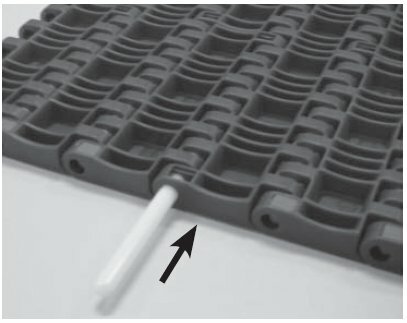 When using plastic straight rails, leave a suitable gap between wearstrips to allow for thermal expansion. Also, secure only one end of the wearstrips. Use a screw to attach only one end of the wearstrip to the frame and leave an appropriate gap at the joint to allow for thermal expansion. 2.Do not use in environments where rail components will be exposed to steam. 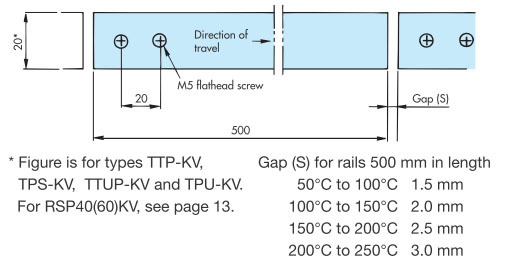 Assuming that these wearstrips are installed in 1-meter units, a gap should be left between wearstrips to prevent chain sag as shown in the illustration below. 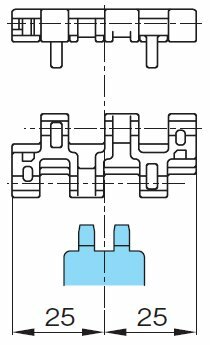 The layout of the supports for chains will vary according to the installation space available and other parameters. A typical layout is shown below. 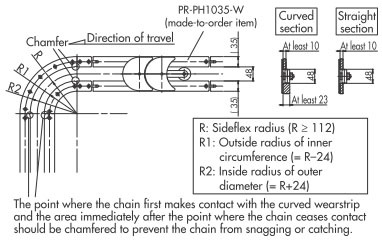 See Question No.8 for the layout of the return way of the chain. 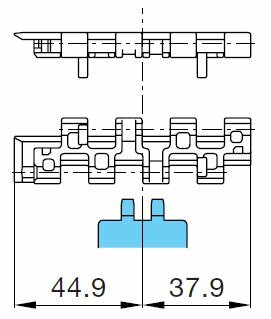 The engagement angle between the drive sprocket and the chain must be greater than 150°. 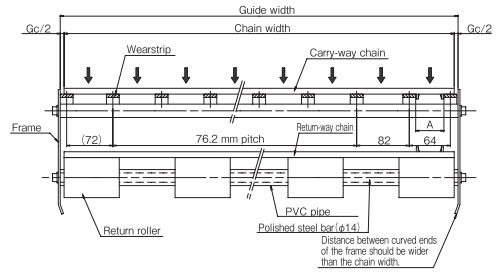 The return-way layout will vary according to the type of chain, the type of goods being conveyed, the flow system and route topology, but in general, layouts will be similar to those illustrated below. This is the most common and recommended layout. Angle of chain wrap on the drive sprocket must be at least 150°. 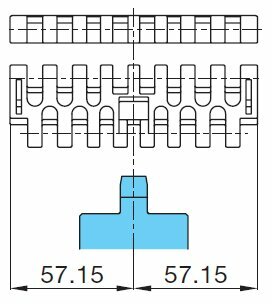 For chain speeds greater than 50 m/min, dimension C must be less than 300 mm. May vary depending on chain type and conveying conditions. To be used only as a basic guide. Suitable for relatively slow-speed conveying conditions (less than 50 m/min). 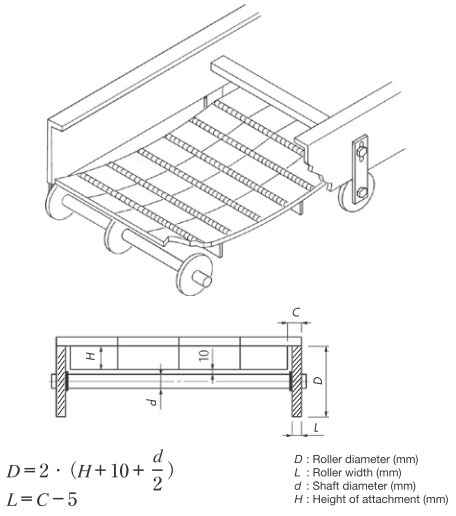 Generally used for accumulation chain (TTPDH-LBP) or roller tables (ST/RT). 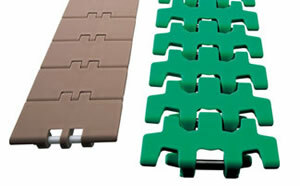 Although this is an economical option for layouts, it has a disadvantage in that the upper surface of the top plates is susceptible to damage from sliding. Suitable for chains with relatively large back-flex radius. 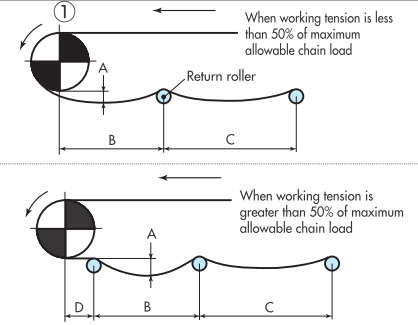 The amount of chain slack A should be approximately 10% of the conveyor length B. 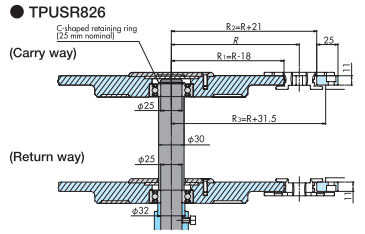 As shown in the figure below, for chains supported by return rollers, rollers must be installed to guide the straight portion of the return-way chain at the point where the chain enters and exits the corner. Note: Use in a dry environment is recommended. Layout will vary depending on the installation space, but the following examples can be used for reference. 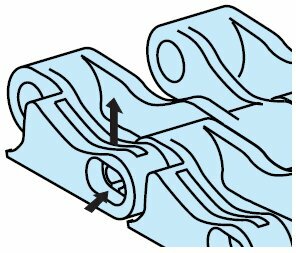 A take-up mechanism must be installed to absorb elongation resulting from temperature changes or wear elongation of the conveyor. See example below for reference. 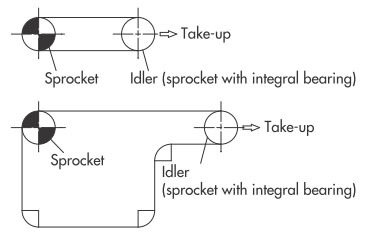 Connecting pins differ by type. 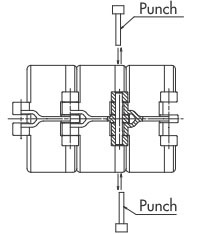 Disassemble, cut, or connect with a punch and hammer suited to the shape of the connecting pins. Only plastic crescent chain has a unique structure. See below for further information. The chain can be disconnected at any link and the pin can be removed from either the left or the right. Pin insertion direction is from one direction only. Place a punch on the opposite end of the pin from the insertion direction, and tap it lightly with a hammer to remove it. 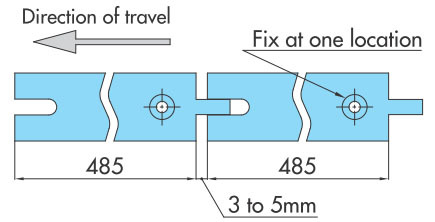 1.Remove the snap cotter pin from the connecting pin, and carefully pull the offset link up and off. 2.Turn the offset link 90 degrees. 3.Remove the main link and the connecting pin from the previous link. Note: When disconnecting, be sure not to pull the connecting pin out of the main link. The direction of plastic top chains and plastic block chains is set. Forward-reverse operation is not recommended. 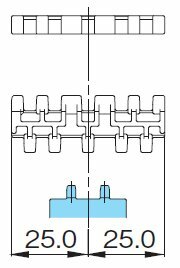 If considering forward-reverse operation, consider using plastic modular chains. The structure of each chain series differs. See below for further information. A snap attachment is inserted in the link from the underside of the link at each end of the chain to prevent the pin from coming out (snap fit). 1) Insert a small flathead screwdriver into the gap (about 1mm) between the link hole and the snap attachment to detach the snap attachment. 2) Use a threaded head screwdriver and screw it into the center hole (1.0mm dia.) of the pin and pull out the pin to disconnect the chain. 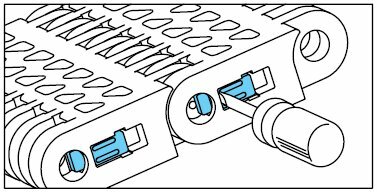 1) Insert a small flathead screwdriver or similar tool between the chain and the plug-clip on the side of the chain. 2) Using the screwdriver as a lever, pry out and remove the plug-clip from the base chain. Work carefully so that the plug-clip does not pop out and fly off. 3) Use a threaded head screwdriver and screw it into the center hole (1.0mm dia.) of the pin and pull out the pin to disconnect the chain. 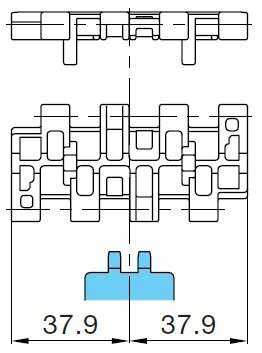 1) When reconnecting the links of a chain, bring the ends of the two chains together, interlace the links, and insert the connecting pin from one side. 2) Then re-insert the plug-clip to cover the insertion area. At this point, check the orientation of the plug-clip (make sure that the protrusion is going into the pin hole), and seat the plug-clip by pushing in until you hear it click into place. 3) Check that the plug-clip is properly installed. Note: When reconnecting chain links, be sure to use the pins provided or special pins. 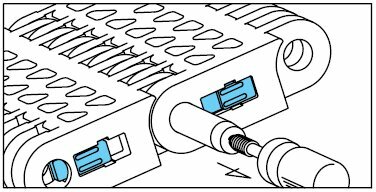 1) Insert a small flathead screwdriver or similar tool into the hole in the plug on the side of the chain. 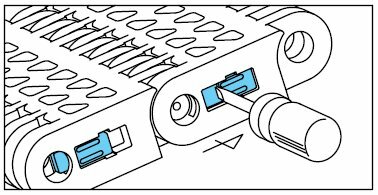 2) Push the screwdriver in the direction of the arrow to slide the plug to the side. Note: The shape for BTM8-M is different. 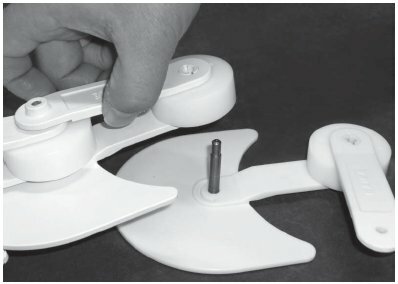 2) Slide the plug to the side to cover the insertion area. ・Place a punch (2.5mm dia. or smaller) on the outer edge of the D-pin on the D-hole side of the link and lightly knock the punch with a hammer to remove the pin. 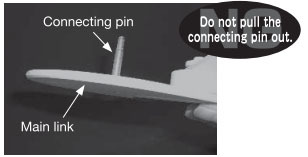 ・Or, the pin can be removed using a small flathead screwdriver from the stopper side. ・Use the exclusively prepared D-pin (colored orange). ・Make certain that the D-pin is facing the correct direction and insert it into the chain link. ・Push by a finger or lightly knock by a hammer the stopper of the D-pin. ・Do not cut the chain where a connecting D-pin (colored orange) is already inserted. 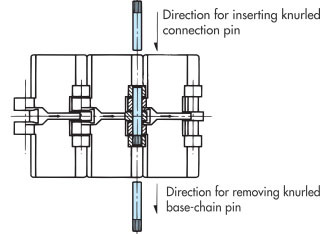 1) Use the exclusively prepared D-pin to connect the chain links. 2) The connecting D-pin is colored orange so as to distinguish it from base-chain pins (colored white). 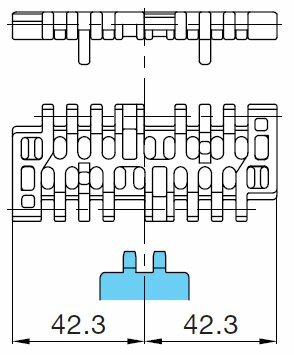 3) One connecting D-pin is provided per chain. Note: A sprocket with 24 teeth cannot be used with BTN5-A (with tab guide attachments). A sprocket with 32 teeth should be used. 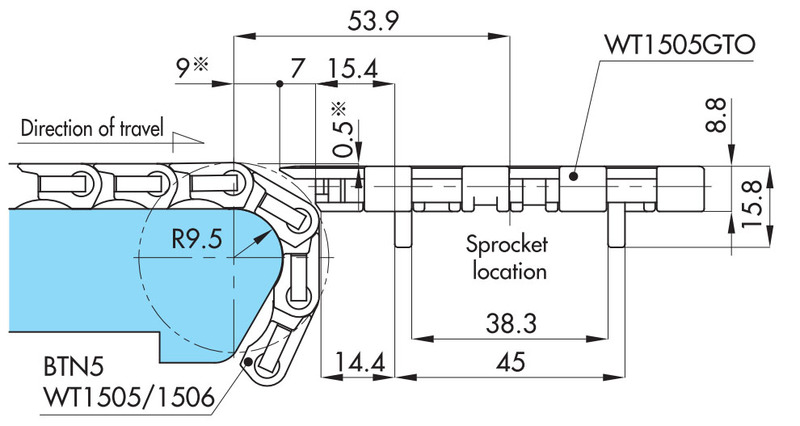 ・Sprocket locations when chain tension rate (F 1) greater than 50%. 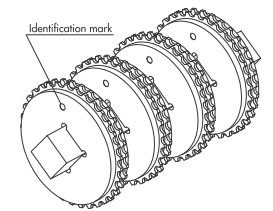 Install the sprockets on the shaft in such a manner that the direction and the position of all the inscribed markings or identification marks on the sprockets are aligned. 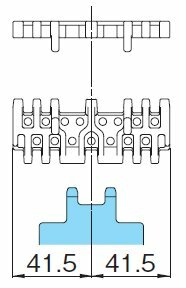 Note: Fix the sprocket to be installed between the tab guide attachments when using a chain equipped with tab guide attachments. 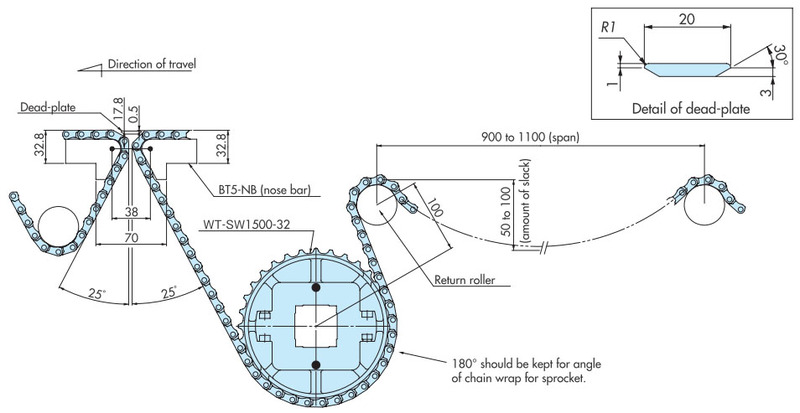 Wind the chain onto the sprockets installed at the given intervals (refer to the “Chain Selection” section). If the sprockets are installed at the wrong interval, the chain may run over the sprocket and break. Make certain of the center distance between the sprockets. 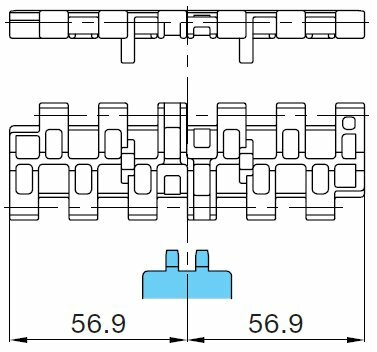 The layout of the supports for chains will vary according to the installation space available and other parameters. A typical layout is shown below. 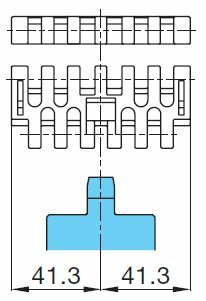 Note: The wearstrip of the drive sprocket section and the end of the frame should be chamfered to prevent interference. 2.For pasteurizers and other special conveyors, contact a Tsubaki representative. 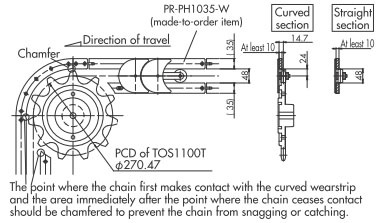 The engagement angle of the chain on the drive sprocket should be at least 180°. If the angle is small, teeth jumping may occur. Tab guide attachments (to prevent meandering) should be installed so as not to interfere with the wearstrip. 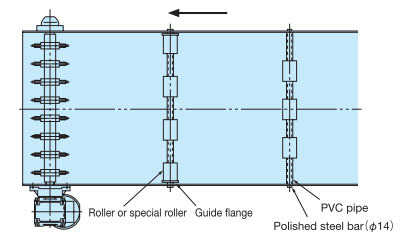 Refer to the table below for guide clearance for chains with guides.Leave a clearance of around 1 mm between chains when used in multi-strand conveyors. 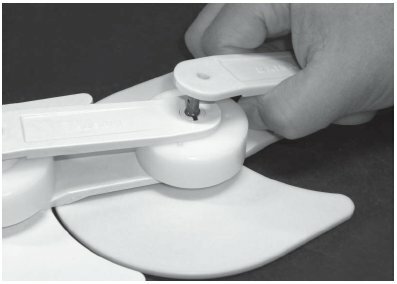 There are two methods of supporting the return way: the return roller system, and the wearstrip system. Examples are shown below. 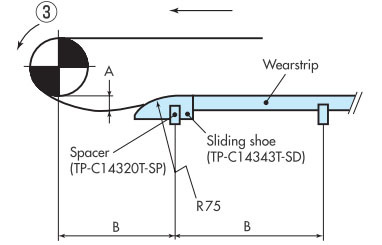 1.The infeed section of the return wearstrip should be made with a large radius of at least R40. 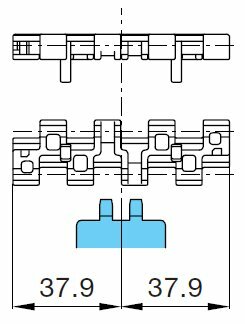 2.Cut the chain so that the catenary section will have an appropriate amount of slack to compensate for expansion and contraction caused by temperature changes. 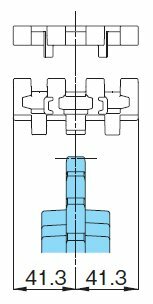 A tensioner or similar device should be used to adjust the chain take-up. 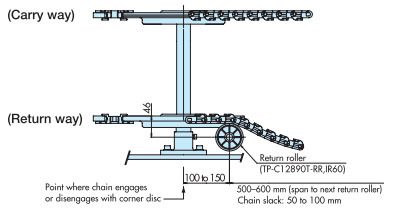 The center distance of the rollers (in the direction of the conveyor width) should be adjusted according to the width of the chain to be used. 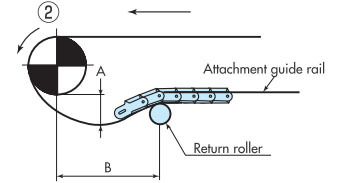 The return way of a chain with attached flights or rubber carriers should be set up as shown below so that the flights do not interfere with rollers. 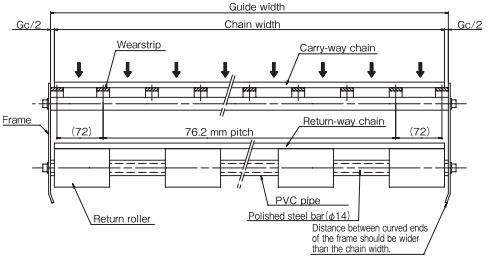 Note: For wide chain, rollers should be positioned at 765-mm intervals. 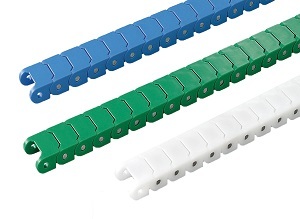 Plastic modular chains are suitable for forward-reverse operation. See below for examples. Using a nose bar can help you reduce the size of your transfer areas. See further information on BTC4-M chains, which can also provide the same function. Note: 1. 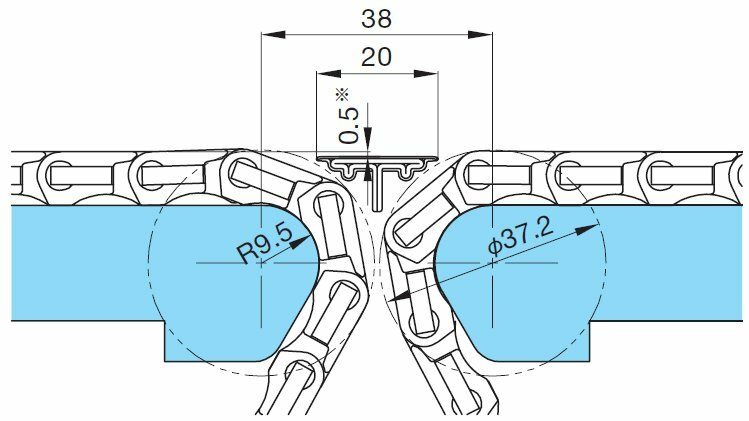 Indicated dimensions are just for information, so finely adjust them depending on transfer conditions of the conveyed goods. Note: 2. Even slight jerking due to the unstable shape of conveyed goods may cause trouble. Contact a Tsubaki representative when such goods have to be conveyed or chain jerking must be avoided. The use of WT1500 series or BTN5 chain allows layouts in which two conveyors connect head-to-tail. 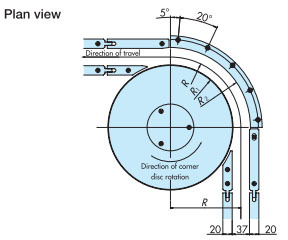 The width of the dead-plate used in the space where the two conveyors abut can be as small as 20 mm. 1.The dead-plate gap (marked with ※ in illustration above) will need to be adjusted depending on the objects being conveyed. 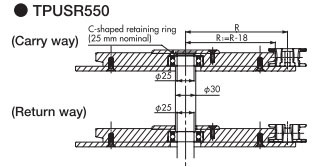 2.Applicable chains are the WT1500 series and BTN5 only. It should be noted that WT1505G cannot be adapted to this kind of layout. Note: The height level of the dead-plate should be finely adjusted according to transfer conditions of the conveyed goods. 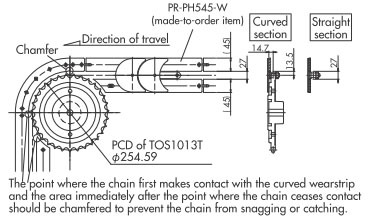 We recommend using a TOD or GTO type chain that has an integrated transfer area. See below for layout and other information. A combination with WT1505GTO enables right-angle transfer of goods without using a dead-plate. Note: Dimensions marked with ＊ will need to be adjusted depending on the objects being conveyed. 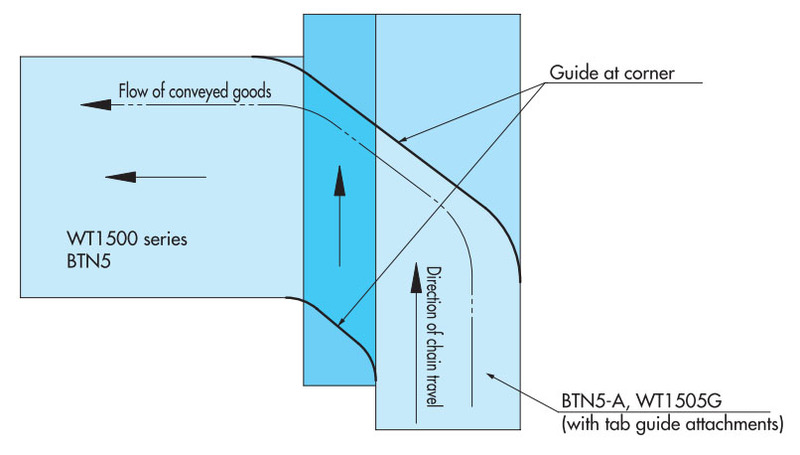 Using Tsubaki nose bars or GTO type chains enables right-angle transfer of goods without the use of the dead-plate that is usually necessary.